OK, I get the joke. I saw the Saturday Night Live skit. I'll admit ... it's kind of funny, but where do I get some? We tried my regular Stop and Shop to no avail. I went on the Ben & Jerry's website and it wasn't listed in their flavor locator. So now what? 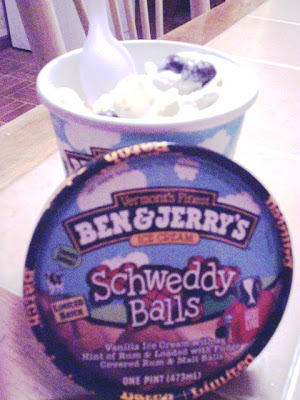 Call around and ask, "Excuse me, do you have Schweddy Balls?" I'd get 10 months! But we really wanted to try some so we called Laura's bud, Scott. Maybe he could ask for this infamous flavor with a straight ... um ... voice. Now where do you look for something when you've exhausted all other options? Walmart! Especially a Super Walmart. At 1:30 p.m. Scott called, bravely asked for the illusive flavor and was told there were two. He put them on hold. Now since Super Walmart is located closer to Scott, they made this elaborate plan for Scott to get the pints and Laura would drive halfway there to meet him and retrieve hers. She also brought him another flavor (Fair Goodness Cake) that he wanted to try because it is not available in his area. Let the pints exchange begin! They met up at Exit 10 off Route 24 at the park and ride. The exchange was made and they both headed home with their treasures. Laura showed me the pint and I cracked up. Ben & Jerry, how do you get away with this stuff? The flavor was described as vanilla ice cream with a hint of rum and loaded with fudge covered rum and malt balls. It sounds delicious! Let's taste. THE VERDICT: Mmm, it's really good. There's a strong rum flavor in this creamy vanilla base and the candy balls add a nice texture. I would definitely get this again, if I could find any. If you run across any, first tell me then try it. I think you'll really enjoy this rich flavor. Hey Ben & Jerry, maybe you've pushed the envelope far enough. People won't get a pint that they're embarrassed to ask for. Visit our friends at MenuJoy.com for great area restaurant menus.